Special Races: Please contact a DM to discuss how you would play the character and what specifically this character would do in order to Bring The Awesome to the server and to the other players. The players should be ready to address DM reservations and to commit to playing that PC as a main character. Players should be not only ready for, but willing to embrace the DMs using that character's unusual race/background as a plot-point in and of itself which can generate adventure fuel for the server. Players should note that PCs and NPCs alike will react to their characters' appearance and attitude. Players MUST be willing to play that race according to the established facts of Faerun that exist on Tales of Moonsea. In addition, to qualify for your app to be reviewed, you need to have played a "base" character consistently here. By consistenly we mean the player applying for a special race have been on the server for a few months at least with a base race character (or more) and has a track record of active play. Carrying the blood of a celestial, an Aasimar is usually a good-aligned and fights against evil in the world. Some have a minor trait suggesting their heritage, such as silver hair, golden eyes or an unnaturally intense stare. Those descended from a celestial minion of a Faerunian deity often carry a birthmark in the shape of the deity's holy symbol or some other mark significant to that faith. * Level Adjustment +1: Aasimar are slightly more powerful and gain levels more slowly than other races. It will take more experience for an aasimar to reach level 2 then it would for normal races, for example. Because they are descended from evil outsiders, those who know of their ancestry immediately consider most tieflings evil and untrustworthy. Not all tieflings are evil or untrustworthy, but enough are that the prejudice tends to cling. Some tieflings have a minor physical trait suggesting their heritage, such as pointed teeth, red eyes, small horns, the odor of brimstone, cloven feet, or just an unnatural aura of wrongness. Those descended from an infernal minion of a Faerunian deity often carry a birthmark of the deity's holy symbol or another trait related to that evil faith. * Level Adjustment +1: Tieflings are slightly more powerful and gain levels more slowly than other races. It will take more experience for a tiefling to reach level 2 then it would for normal races, for example. REMINDER to players: They will be expected to roleplay CHA penalty appropriately. Hidden in the depths of the Underdark live the svirfneblin, or deep gnomes. Reclusive, suspicious, and resentful of intrusion into their cavern homes, the deep gnomes share little of the humor or openness of their surface cousins. Where a rock gnome community bursts with energy, excitement and laughter, a svirfneblin city is a dull and colorless place of echoing silence and furtive motion in the shadows. All hands are raised against the svirfneblin... or so the deep gnomes believe, anyway. The deep gnome may be the world's stealthiest and most elusive folk. Centuries upon centuries of surviving the deadly perils of the Underdark have bred in this race an amazing gift for avoiding attention. In their cavern homes, they are nearly undetectable with magic and even in the strange and threatening (to them) surface world, the deep gnome's natural stealth makes them difficult to spot or catch. Svirfneblin have gnarled physiques, brown or gray skin, gray eyes, and gray hair (although males are bald). They tend to be sullen, withdrawn and suspicious to a fault. * Level Adjustment +3: Deep gnomes are more powerful and gain levels more slowly than other races. It will take much more experience for a deep gnome to reach level 2 then it would for normal races, for example. Long ago, mind flayers conquered the strongholds of clan Duergar of the dwarven kingdom of Shanatar. After generations of enslavement and cruel experimentation at the hands of the illithids, the duergar rose against their masters and regained their freedom. They emerged as a new subrace of dwarf with limited mental powers. The gray dwarves are an evil and bitter race, but retain the superior skill and workmanship of dwarvenkind. They have found a niche for themselves in the Underdark, creating armor and weapons to trade with the warring races of that realm. They seem to have been denied the Thunder Blessing. Duergar on the whole are evil, but some turn their backs on their fellows and seek a different sort of life. For some, this means abandoning the evil gods of the duergar and embracing the traditional pantheon, while for others it is a more practical betrayal, using involving stealing from other gray dwarves. When discovered, an outcast is typically stripped of his possessions, tattooed on the face and arms to mark him as a criminal and cast out under penalty of death. Some clans secretly aid their outcasts Â– or encourage them to leave before they are found out. To return is to die. This grim fate drives most outcasts to the surface, where they struggle to survive in an unwelcoming world. The surface dwarves hate the duergar because they turned to evil, and no other surface race holds much love for the gray dwarves. Most of the gray dwarves met by surface dwellers are tattooed exiles, although a small number were lucky or smart enough to leave before being discovered. Male and female duergar are bald, and women do not grow beards. They are much thinner than other dwarves, with severe facial expressions, gray hair and gray skin. 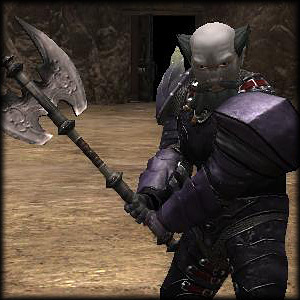 * Level Adjustment +2: Duergar are more powerful and gain levels more slowly than other races. It will take much more experience for a duergar to reach level 2 then it would for normal races, for example. Drow Descended from the original dark-skinned elven subrace called the Illythiiri, the drow are cursed into their present appearance by the good elven deities for following the goddess Lolth down the path to evil and corruption. Also called dark elves, the drow have black skin that resembles polished obsidian and stark white or pale yellow hair.. They commonly have very pale eyes (so pale as to be often mistaken for white) in shades of pale lilac, silver, pink and blue. They also tend to be smaller and thinner than most elves. Most drow on the surface are evil and worship Vhaeraun, but some outcasts and renegades have a more neutral attitude. * Level Adjustment +2: Drow are more powerful and gain levels more slowly than other races. It will take more experience for a drow to reach level 2 then it would for normal races, for example. As the offspring of a drow and a human, half drow find it hard to fit in. As they belong neither to the drow nor to the human race they have no home in a hostile world. To the drow, half-drow are the weak children of an "inferior" race, and to those on the surface they may as well be drow. Most cannot tell the difference between a drow and a half drow, and half-drow are simply considered to be too much like drow to be trusted. Half-drow are rarely accepted on the surface. A half-drow can, however, prove with their skill, bravery and determination that they are not like the drow, and thus can win acceptance on the surface. Many half-drow adventure for just this purpose; to prove their worth. Half-drow, contrary to their drow heritage, are more often good than evil. They are not accepted among the drow people of their parent, and their non-drow heritage helps them to realize that the tenets the drow follow are lies, which, in turn, leads them to abandon the ways of drow. There are four types genasi, each corresponding to a type of elemental. The origins of the genasi are unclear, perhaps they are the offspring of efreets and other djinn, or maybe they are the result of a ancient experiment by a mad archmage. This last theory is supported by the only common trait of the four types of genasi, they each have glowing runes and symbols tattooed upon them from birth. These symbols are the sign of a genasi's birthright and seem to have a link to the element the genasi is bound to, as each of the four types have different runes. Air genasi are fickle and capricious, often changing sides mid-argument or outright quitting a conversation halfway through. They almost never keep their word, more often than not they abandon what they promised to do for something that looks more fun almost as soon as they promise it. Above all air genasi hate being forced to do anything, often going out of their way to break any promise they were forced into. Air genasi often spend their days wandering aimlessly or beginning random pieces of art and then abandoning them for something else, very easily bored air genasi like to travel and find new places, bit usually return home once they get bored of walking. Many air genasi take up adventuring for the thrill, but only a few keep it up for more than a few days. Air genasi are the most human-like of the genasi, differentiated only by their ice blue eyes and quickly whitening hair, which seems to have a perpetual breeze running through it. They tend to be on the lighter built side and weigh less than most would expect. Earth genasi are taciturn and stubborn, never breaking a promise once its been made and are as slow to change their mind as the earth itself. Earth genasi are slow to anger, ignoring insults and threats as though nothing had happened, when they are angered however, they are more terrifying than any earthquake, often beating the offender half to death. Earth genasi prefer simple, boring lives to excitement and danger, often working as miners or farmers in small, peaceful towns. The few that do become adventurers do so to better themselves and see the world; as although earth genasi are not prone to wandering, they enjoy traveling and feeling the earth beneath their feet. Earth genasi are heavily built and slightly shorter than most humans, their skin is a coppery brown tone beyond what any amount of sunlight could achieve and their eyes and hair are usually dark brown. Fire genasi are rash, impatient, hot-tempered and passionate, arguing a point long past when a any reasonable person would stop and throwing themselves at risks without stopping to think, above all fire genasi are fueled by a kind of manic energy that makes them seem capable of anything, when a fire genasi devotes himself to a task he will never stop until it's done. Fire genasi enjoy art and music, often going for days without eating or sleeping while they work on a painting or song. Like air genasi they like the fast pace of city life and quickly grow bored with the country. Their lives are often completely consumed by their current obsession, they spend their days completing one project and starting the next, rarely stopping except to recover from the lack of sleep and food. Many fire genasi pursue careers as adventurers, enjoying the thrills and challenges that such a lifestyle presents, those that do find their talents well-suited for such a life, particularly their innate sorcerous talent. Fire genasi are the most noticeable of the genasi, having orange-red skin and and eyes makes them stand out in a crowd and sparks jump when they snap their finger or clap their hands. They are averagely built for a human but tend to be frail as when they are focused upon a piece of art or some other project they rarely eat or sleep. Water genasi are calm, patient and serene. They have the ability to enter a trance-like state that increases their senses and martial prowess. They take things slow and are rarely in a rush, often thinking over a subject for hours. Water genasi rarely speak unless they have something important to say, often fading into the background for long periods of time then suddenly returning to the present. Water genasi live lives of quiet seclusion and meditation, pondering and observing the state of the universe. They avoid even small towns, only visiting civilization when they have no choice. Water genasi have pale greenish-blue skin and and greenish eyes and hair. Their other distinguishing feature is their webbed fingers and toes and vestigial gills. Gray orcs are nomads. They dwell in remote, desolate corners of northeast Faerun and eke out a meager existence, traveling along traditional migratory routes between established campsites and favorite caves as the seasons change... The gray orcs are zealots, and the word of their tribal clerics is law. Clerics from other tribes are usually viewed as heretics, despite the fact that both tribes likely worship the same deity in the same manner. The Yuan-ti are descended from humans whose bloodlines have been mingled with those of snakes. Their evil, cunning, and ruthlessness is legendary. Yuan-ti constantly scheme to advance their own dark agendas. They are calculating and suave enough to form alliances with other evil creatures when necessary, but they always put their own interests first. Yuan-ti that can pass for humans with suitable clothing, cosmetics, and magic are known as purebloods. These creatures are usually charged with infiltrating humanoid societies and managing covert operations that require direct contact with humans.